Rumors around an upcoming iPad Pro launch have been increasing in recent months, and now it’s looking more likely than ever that 2018’s professional tablet from Apple will bear the resemblance of a big iPhone X. Up until the iPhone X, every iPhone and iPad display had squared-off edges, but the iPhone X introduced a display with rounded edges to match the curvature of the handset itself. While digging through the iOS 12 developer beta, 9to5Mac has found an asset that appears to be a visual mask used to round the corners of the UI, and it bears the codename “J3XX”, which itself is indicative of the 2018 iPad Pro model. By itself, this strongly suggests that the 2018 iPad Pro will follow in the design footsteps of the iPhone X, sporting rounded corners on its display. When you consider this UI mask alongside rumors that this iPad Pro will support Face ID, it’s seems increasingly likely that this year’s model won't feature a Home button and will have severely reduced bezels. Some more juicy hints that support this rumor have been uncovered by 9to5Mac in the form of two small icons in a battery usage diagnostic. These tiny tiles seem to show both a current iPad with prominent bezels and a Home button, and a future model that lacks either. 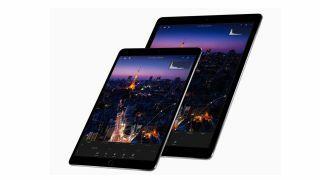 We're expecting to hear more about the upcoming iPad Pro at the anticipated iPhone XI launch in early September, but until then, be sure to follow all the latest iPad Pro news, leaks and rumors here at TechRadar.